Today I took ThingOne into town on the bus for a special treat. Her first trip to the cinema. I'd been thinking she was old enough now, but had been waiting for the right film. I didn't want it to be too fast or confusing for her. I didn't want it to go over her head. If anything I wanted the film to be secondary to the experience of going to the cinema. When I saw earlier in the week that The Little Polar Bear - The Mysterious Island (aka The Little Polar Bear 2) was being show as the Kids Club film in our local arts cinema on Saturday morning I thought it was ideal. I'd never heard of it. It's a German cartoon apparently (dubbed into English, which is good since ThingOne doesn't really do subtitles). Reviews warned that there wasn't much in it for older children but might keep toddlers interested. The kids' session in the cinema is good. Cheap, especially as the kid's ticket costs and an adult goes free. I'd decided to splash out on some popcorn to really show her the cinema experience, and it wasn't until I paid that I found they had a special on popcorn for the kids' films. It ended up costing me less than a fiver for both of us plus a small popcorn. She loved the popcorn. Except I told her at one point that a piece I had looked like a dinosaur, and then found I'd created a game whereby we had to tell each other what each piece looked like. ThingOne seemed to have limitless imagination ("This one looks like a bird, sitting down", "This one looks like a sea monster's head and shoulders"). I soon found myself clutching at straws ("This one looks like a cloud", "This one looks like a cat's back leg"). Soon the lights went down, ThingOne got excited, she tried to read the Federation Against Copyright Theft wording ("You! It says You!") and then the movie began. She's seen full films on DVD, so I knew she could sit through 75 minutes (that's usually how long kid's movies last). We tend to show her them in three 25 minute sittings though. Once she's seen a film a few times through she has occasionally sat through the whole thing but she's used to seeing films as three part storys, what she calls the beginning, middle and end. In a way she's now well versed in the three act structure. She's never watch a film she's not seen before all the way through though, so I was concerned it may prove too much. It was a pretty simple story, so probably ideal for her. She wanted very much to break it up into three acts ("Is this bit the beginning, the middle or the end?") and we talked a fair bit through it. Partly this was me explaining what was happening to her and what the names of all the characters were. This was fair enough as there were a lot of characters, and the script wasn't the best. The dubbing was even worse at times and the use of regional accents to differentiate species was not useful. It was as well it was a kids' screening, since I wouldn't want to be sat near us in a normal screening (say, for example, if Anne and I had gone to an evening showing of The Little Polar Bear 2). By an hour and five minutes in she was asking if it was near the end, so I'm glad I didn't start her on a longer movie (say, The Godfather, Part II). ThingOne seemed mesmerised by the whole thing, and seemed to want to get the film on DVD so we could watch it over and over again. That ain't going to happen. As someone who has mixed feelings about Disney movies and their merits I can at least now appreciate their strong points and especially their songs more. The song in TLPB2 was pretty dire. But again, I should stress that ThingOne had a great time with it so I think it was a good choice. 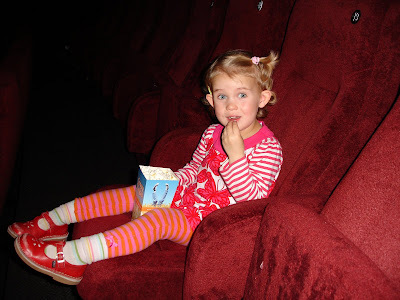 I ignored the Federation Against Copyright Theft's warning, and took a photo of her enjoying her popcorn. After the movie we stayed to the end of the credits, not because ThingOne has sufficient respect for the creative process as much as she wanted to hear the substandard song again. Plus she was interested in who would turn the screen off after the credits had rolled. She seemed to think a staff member would have to go down the front to press the switch. The fool! Then we went to Wagamamas for some lunch, and then the bus back home. She seemed so grown up to me today, especially as I watched her slurp her noodles and try to use kiddie chopsticks in Wagamamas (mostly she just used her fingers). Anne and I are really trying to make the most of these early years with her, since in just over a year she'll be in school, and we know how quickly a year seems to go with kids. I don't know for sure what she got out of the cinema experience, but she's talked about it a lot since and I had a really good time. I'd been excited about taking her and have been waiting for the opportunity (whilst accepting that she's still a little young for it). Maybe today was more for me than for her.